AFDA Durban dean Franco Human had the pleasure of attending the Inaugural Screen Excellence awards held at the Zimbali Fairmont hotel in Ballito on Saturday the 26th October 2013. The SEA seeks not only to recognise but also celebrate these concealed yet extraordinary individuals. They might not be in the spotlight but their shine resonates daily was the caption in the programme for the evening. The awards are presented by the National Lotteries Board & Batebang Community Services whose goal is for the SEA to become this cohesive element whilst honouring the achievements of the individuals. It should be noted that this will be the first film Awards in South Africa of this nature where focus is not on the artists in front of the camera but on the people behind it. SEA will also honour legends that have contributed immensely in film and television production in South Africa from Scriptwriting, directing, producing, sound design etc. SEA actively represents the South African Motion Picture Industry, and art community on issues such as development and preservation of South African talent and skills. It also promotes film and television production, to reach international standard. In pursuing its commitment to address these and other issues SEA undertakes a variety of national initiatives. SEA will raise awareness and support South African film production and talent. SEA will work to promote film production in communities and schools across the nation. SEA believes in creating performing arts as a stable future for our youth through various programmes. AFDA was awarded the SEA award for the best school that contributes to the nation. ‘It is a great honour and pleasure to be here to accept this award on behalf of AFDA as the Campus Dean of our new campus here in Durban. 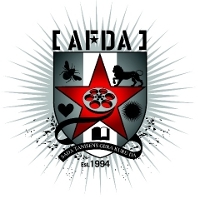 At AFDA our overall goal is to develop an institution that meaningfully contributes to South African Nation building and rewards stakeholders by providing a stimulating and globally integrated tertiary learning experience, that empowers graduates with recognised professional skills levels, creating a pool of highly talented alumni that will contribute to the growing economically viable South African entertainment industry. The values our students have instilled in them when they graduate are core values needed in the entertainment industry in order to keep a high standard of professionalism as one expects in the industry. These values are: Self Discipline, Integrity, Reliability, Humility and Passion. We are very proud of our new AFDA Durban campus, established in 2013 when we opened the doors on the 4th of February with a contingent of 74 pioneering 1st year students, compared to the original 6 when JHB opened in 1994. These 74will be the first to enter the KZN entertainment industry in 2016. We may be the youngest of campuses but we are rich with diverse culture and a strong work ethic and ethos on the student body taking into account the values of AFDA. We are in the heart of Durban taking in the rich sub-cultures and flavours of Kwazulu Natal, injecting it into our projects. The campus includes studios, lecture rooms, rehearsal rooms, recreational areas, staff and administration areas, storage and parking facilities and have all necessary equipment in order to deliver outcomes in stage, film and television.